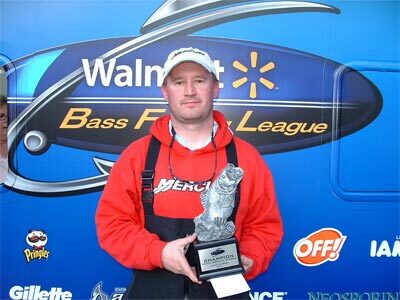 Boater Jeremy Wilson of Blacksburg, S.C., caught a five-bass limit weighing 21 pounds, 6 ounces Feb. 19 to win $4,359 in the BFL South Carolina Division tournament on Lake Murray. He was fishing mid-lake in six to 12 feet of water using jigs with brown and green pumpkin trailers to haul in his limit. Jeff Rikard of Leesville, S.C., caught a five-bass limit weighing 14 pounds, 5 ounces Feb. 19 to win $2,140 in the Co-angler Division. He was fishing points in six to eight feet of water with crankbaits to catch his limit. The next BFL South Carolina Division tournament is scheduled for March 19 on Lake Wylie in Lake Wylie, S.C. After the fifth South Carolina Division tournament is complete, the top 40 boaters and 40 co-anglers based on point standings will qualify for the Oct. 13-15 Regional Championship on Smith Mountain Lake in Huddleston, Va. Boaters will compete for a top award of a Ranger 198VX with a 200-horsepower Evinrude or Mercury outboard and a Chevy pick-up, while co-anglers will fish for a new Ranger 198VX.